Safavieh Cape Cod 6-Drawer Cream Storage Unit - 29.9" x 13" x 27.6"
A carefree spirit infuses Safavieh's 3-drawer Cape Cod Storage Table. 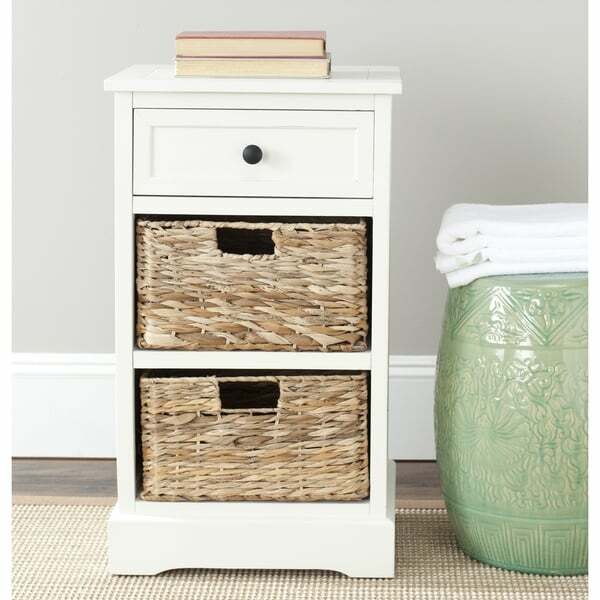 One drawer for easy storage and two removable woven rattan baskets with cutout handles make decluttering and cleanup a breeze. Handsomely crafted of durable pinewood with a distressed cream finish, this table brings a coastal vibe to your bedroom, living room, or master bath. Its charming aesthetic and petite frame ensure that it will work equally well in a compact apartment or a spacious family room. This is as nice looking as it shows in the picture, and arrives put-together which is a plus. I am using this in my bedroom as storage for my workout clothes so I can easily grab them in the morning. It would also make an excellent night stand. The baskets on the bottom are a little rough, so clothing storage is probably not the ideal purpose for this unit, but it meets my needs and matches the Safavieh Damien Cream 3-drawer Storage Bench which I also bought. I am very pleased with my purchase and I think this item is higher quality than it would seem for the price! This is a nice storage table. It's just the right size so it doesn't take up much space. I like the cream color. I bought the two other matching pieces. The drawers don't slide as good as I would like. I would still recommend this storage table. I was very impressed when receiving this storage table that it was real wood. It a solid piece and comes with 2 storage baskets that are also well made. We use it for our living room as a accent table and we have got many compliments on it. Would definitely buy another. No screws and pegs here! Fully assembled, fine-look, wood storage table. We are using two as nightstands bookending a white "Nolita"headboard, king headboard we put together from Overstock. These are cream color and the headboard white but they are quite close in color. I have the bench and they 3drawer table nice finish and looks great in my kitchen .. The basket that came with it was very discolored I requested a new one . Love these small tables. Light but not flimsy. Cream colored with straw baskets create a beach toy casual coastal feel. I bought two and used them in an office. Love them! These are lightweight end tables that look perfect next to a bed. The baskets are good quality and they are the exact look that I was going for. My wood floors weren't perfectly even, so I added some felt feet to make them level. They arrived in less than 5 business days fully assembled and in great condition. I couldn't be happier with this purchase! Love this table . Excellent storage solution for my bathroom. Having a little problem with the drawer sliding in and out. However that is resolving itself as I use it . As others have stated, the drawer and baskets on this item don't open/close smoothly. In addition, our baskets were very torn/worn upon arrival, as though they'd already been is use for years. The smell was AWFUL. Likely not the fault of the piece itself, but a scent i wanted in my home and added to my decision to return. The quality overall lacked here. Just what I wanted, shipped quick. Nice little storage table that can be used many ways. Bought it as a gift & has been used in a kitchen & now an office. This was supposed to be a 2 day delivery. It’s been 7 days and I still have not received item. Overstock asked me to write this review on an item I haven’t received yet. Think they should check their records before asking for a review. Very disappointed. This is a really cute product. Definitely a full on cream instead of a white color. Only easing i gove 4 vs 5 stars is because the drawer and baskets don’t slide in and out very easily. Excellent quality end table for the price. They look perfect in our family room. Needed storage in our walk in closet. Liked the looks of this piece,especially for the price. Right style,- but really wanted a true "white" that was 30" tall & 20" wide & 15" deep. This was as close as I could find, so I hope it isnt too small. "is this table white or cream? the description says cream but the picture look white"
Hello qpope7, we appreciate your inquiry. This table is more of an off white (ivory). We hope this information has been helpful. Thank you for shopping with us. Have a great day! "are the shelves solid that the baskets are on? for example could you take one out and use it as a shelf instead?" Hello jazzykat162, we appreciate your inquiry. Yes, the shelves are solid. You could take the baskets out and use it as a shelf. We hope you have found this information helpful. Thank you for shopping with us. Have great day! "Is this Cape Cod storage table fully assembled?" Hello! I love this storage table. Yes, this comes fully assembled. I hope this helps. Thanks for shopping with us.